FILE - The towers of the German company Deutsche Bank are pictured in Frankfurt, western Germany, Feb. 15, 2017. Two U.S. House of Representatives committees have issued subpoenas to multiple financial institutions, including Deutsche Bank AG, for information on President Donald Trump's finances, the panels' Democratic leaders said Monday. 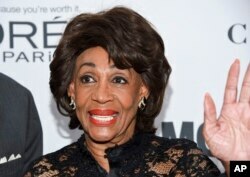 FILE - Congresswoman Maxine Waters (D-Calif.) attends the 2017 Glamour Women of the Year Awards at Kings Theatre in New York, Nov. 13, 2017. The New York Times, which first reported the committees' actions Monday, said Citigroup, JPMorgan Chase and Bank of America had also received subpoenas.